Select File →Open →File from the main menu. The dialog box in Figure 2.1 appears. Click Go to Installation directory near the bottom of the dialog box. Double-click the Data Sets folder. A data table appears, showing a tabular view of the data. Connected to the data table (although invisible) is an underlying DataObject that was created from the SAS data set. The DataObject holds the data in memory; the data table displays a view of the data. Note: Clicking Go to Personal Files directory navigates to your personal files directory. 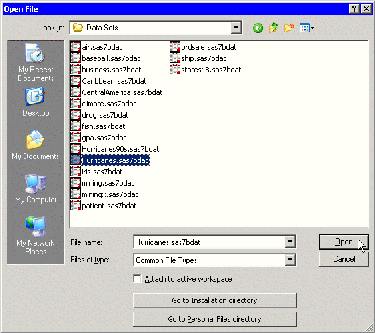 By default, the personal files directory corresponds to the Windows directory shown in Table 2.1.